In Zones 8 and lower (i.e. colder), it's too late in the season to have success planting Zenith Zoysia seeds. Wait to plant until spring, after danger of last spring frost. It is best to purchase fresh seed closer to planting time to get the best germination rate. Patten Seed Company is leading the way in Zoysia seed production with Zenith Zoysia - uniquely available as both sod and seed. When you order from Patten Seed Company, you're ordering directly from the family farm. Establishing lawns with Zenith Zoysia seed is superior to Zoysia grass plugs: it's easier, faster, and cheaper. Zenith Zoysia seed is ideal for: -Home lawns -Commercial landscapes -Golf courses (fairway, tee, or rough) -Sports fields -Roadsides -All turfgrass needs from Miami to Baltimore and west to Kansas city and beyond. Zenith Zoysia seed has these further characteristics: -Zenith Zoysia has a low water requirement (drought tolerant) -Zenith has a low nutrition requirement -It's also a dense turf that resists weeds. FOLLOW ALL DIRECTIONS ON THE BAG/INSERT FOR ENSURED SUCCESS WITH ZENITH SEED. In Zones 8 and lower (i.e. colder), it's too late in the season to have success planting Zenith Zoysia seeds. Wait to plant until spring, after danger of last spring frost. It is best to purchase fresh seed closer to planting time to get the best germination rate. Zenith makes a very dense, dark green, handsome lawn that's drought tolerant, cold hardy, and tolerant of extreme heat. Shade tolerant; widely adaptable to full sun or light shade. In warm soil (60° or higher) Zenith seed will sprout in 14-21 days. Each 2lb. bag will cover up to 2,000 square feet. 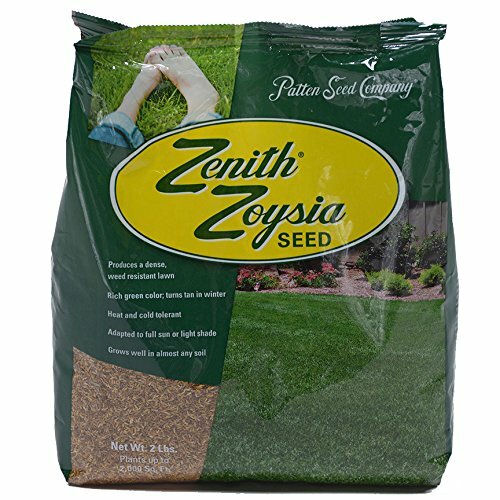 Zenith Zoysia from Patten Seed is 100% Pure Seed (no mulch) - you get the actual 2 lbs. of seed. If you have any questions about this product by Patten Seed Company, contact us by completing and submitting the form below. If you are looking for a specif part number, please include it with your message.